Ok, when I heard that Vivienne Westwood was designing the new uniform for Virgin Atlantic, I was really excited to see what it would be like. Even though I left the company 10 years ago now, I still hold them very close to my heart. It was the very first airline I ever joined and I was a young 18 years of age when I walked into their head office and began working as a Reservations Agent before very quickly getting my wings and taking to the skies in that red suit. Back then, the uniform was designed by British designer John Rocha and I felt so proud to wear it. There has been a couple of small changes since then (the revival of the red shoes and a small change to the scarf) but the overall uniform design remained the same so it was due a much needed facelift. I think choosing iconic designer Vivienne Westwood was a real coup....her quirkiness and innovative style is really in keeping with the Virgin brand. This time there is no scarf and instead a ruffled shirt (Black shirt for the onboard supervisors/managers and white shirts for the rest of the crew). It will be interesting to see what the feedback is from the crew wearing this uniform on this aspect as it looks as though it will be difficult to maintain the crisp look of that ruffle. I'm also not sure about the 'one buttoned' blazer - that can sometimes look untidy (especially for bigger busted ladies! ), I think a more tailored jacket would have been better. I do love the overcoat though, so chic and glamourous. The uniform is currently on trial for a select number of staff and they will collate feedback before rolling out to the rest of the company. 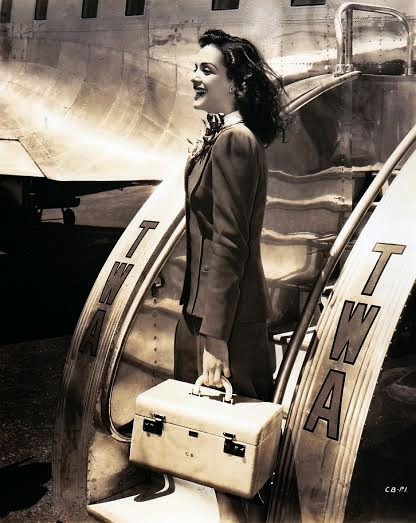 Although those golden days of air travel have gone and evolved somewhat, there is still a big interest in the perceived glamour of these ladies of the skies...the launch of the new Virgin Atlantic uniform made the news and there was a glamorous celebrity launch to unveil it. This olive green uniform designed by Giorgio Armani in the early 90's for Italy's national airline was quite military-esque but I think beautifully tailored and sophisticated. I couldn't think of anyone else to design a uniform for the country who has probably the most stylish people in the world?! I like this Christian Lacroix uniform which is actually a very Parisian look for an asian airline, which is unusual. The slim fitting navy blue dress with oversized red belt to cinch the waist is stunning topped off with the classic pillbox hat. 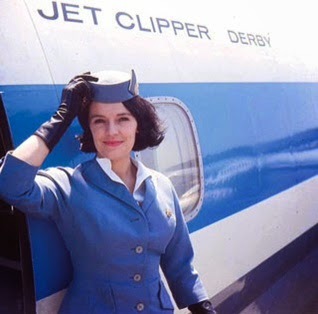 I couldn't not mention my beloved British Airways, (who I work for now but no longer where the uniform) who have had a number of iconic uniforms over the years. The current Julian Macdonald uniform has been in place for a few years now and is due an update. I would love to see another British heritage brand like Burberry perhaps design the new BA uniform...imagine the iconic Burberry trench overcoat in navy blue worn over the uniform where you can just see flashes of the classic Burberry check design when walking - fabulous! And then of course, the Pan Am sisters...where for me, all thoughts of the glamorous golden age of air travel stem from. The iconic blue uniforms, the white gloves, the perfect hat, the poise, the elegance....so chic! There are so many fabulous uniforms that I could mention here that this post could go on forever...I didn't even get to talk about Air France's Balenciaga outfit...hello?! !